cardigans and kids: sewing with vintage fabrics and a sweet pattern. 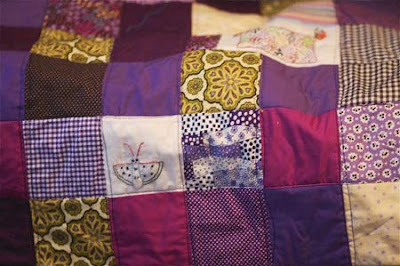 sewing with vintage fabrics and a sweet pattern. After inheriting so much fabric from Grandma Helen this last month I was reminded of the the fabric she gave me at least a year ago. I had already cut out and stored it in a large zip lock bag, just waiting to be sewn into this lovely Jane Market Bag from Alicia Paulson, otherwise none as Posy Gets Cozy. I think all the photos made me think the Market Bag would take me longer then it really did take to sew. 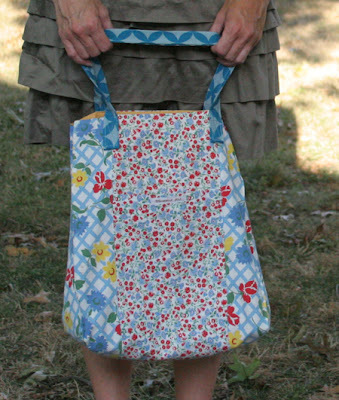 I've been sewing a lot of bags lately, working on getting the patterns ready for print (or at least PDF download version) and this was a fun project to work on. She goes at things from a different angle then me, and it is always good to see someone else's perspective on projects. Anyway, I love the market bag and I almost through my caulk gun and paint brush in there because today was full of caulking a shower for the first time ever, as well as working on getting the bathroom painted.